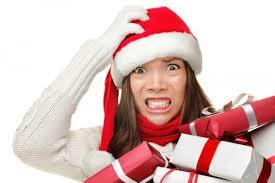 There’s no denying that the holidays can be a very busy and stressful time of the year. Normal work and family obligations are compounded by the addition of holiday parties, shopping, school programs, invading relatives and lots and lots of FOOD. -Review your calendar each week to see what events are coming up. Parties can serve as your “planned treat” for the week. Instead of going all out at every event, enjoy one special treat at each event, and then stick to lean proteins, complex carbohydrates, and non-caloric beverages for the remainder of the event. -Drink plenty of water! People commonly mistake thirst for hunger. Load up on plain water to feel fuller and improve energy levels. -Be mindful of what (and how much) you’re eating. Fix yourself one small plate and then put it down. Same thing with the wine glass. Don’t linger at the buffet table. Work the room with a glass of water or club soda with lime instead. – Use what I like to call the “24 Hour Rule’ : If you’re bringing home sweet treats from school or work, let the family enjoy them at home for 24 hours ( enough time for everyone to enjoy a bite/piece/serving) then throw it out or donate it! -Don’t forget to pack your cooler. Packing your meals for the day and having healthy snacks with you at all times will ensure that you’re sticking to your nutrition plan and eating at the right frequency. Walking into a holiday party starving because you haven’t eaten all day is a recipe for disaster! 2). Balance Your Plate: And no, I don’t mean on your head or on your great uncle Carl’s spectacular potbelly while he’s snoring away in your living room recliner. When enjoying holiday meals, choose your foods the same way you would during your regular meals; 50% of your plate vegetables, 25 % protein, 25 % carbs. Enjoy the cake, just be mindful of portions and don’t forget the protein! 3). Intensity is Key: Instead of skipping workout all together, keep the duration short and the intensity high. Fitness Evolution offers boot camps, HIIT training and Co-ed workouts designed to do just that! Click here to check out our class schedule or to book a session with a trainer. If you’re super short on time, aim for 15-20 minute workouts at home! You’ll be amazed what you can accomplish with body weight exercises like squats, push ups, lunges, tricep dips, and crunches. Add in a few jumping jacks and burpees and you’re guaranteed to get sweating! Happy Holidays! For more information and our latest updates, be sure to like our Facebook Page!